Lenovo (HKSE: 0992) (PINK SHEETS: LNVGY) announced today it is working with Amy Poehler's Smart Girls on a three-part video series spotlighting women in technology in support of LenovoGameState. Lenovo (HKSE: 0992) (PINK SHEETS: LNVGY) announced today it is working with Amy Poehler's Smart Girls on a three-part video series spotlighting women in technology in support of LenovoGameState.com - a free, online destination for kids ages 13 and up. The site lets kids become part of a Code & Play Adventure, powered by Code Combat, where they can learn to code by playing a game. 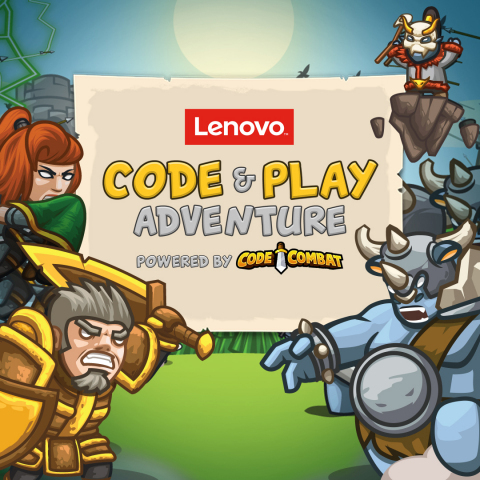 The more they play and learn, the more chances they have to win Lenovo products and a $2,500 scholarship to a coding school or camp. The first video premiered online today on Smart Girls' Facebook, Instagram, Twitter and YouTube channels. It shares the story of Betty Holberton who worked as one of the first computer programmers ever for the U.S. during World War II. A second video spotlighting neuroscientist Dr. Sheila Nirenberg of Cornell University and her breakthrough work creating sight through neural coding will debut March 10; and a third video taking viewers inside a mentoring session between a game designer and teen girls will premiere later this month. "Lenovo and Smart Girls both have a passion for using technology to enable young people to pursue their dreams," said Meredith Walker, Co-Founder and Executive Director of Amy Poehler's Smart Girls, producers of the three-part video series. "Coding gives you the power to create just about anything - from games and computers to rockets and robots - and our goal in producing this video series was to inspire through the stories of trailblazers in the field." According to Girls Who Code - a national non-profit organization dedicated to closing the gender gap in technology - by 2020 there will be 1.4 million jobs available in computing-related fields. Women are on track to fill just three percent. Tapping into the STEAM (Science/Technology/Engineering/Arts/Mathematics) and "Maker" movements, LenovoGameState.com combines the entertainment of traditional computer games with the educational benefits of real code development, providing an even playing field for girls and boys to learn to code at their own pace. "We build our technology to empower young people to become not just content consumers, but content creators," said Ajit Sivadasan, Lenovo Vice President/General Manager Global eCommerce. "Lenovo is committed to the STEAM movement in the US and is taking steps through programs like this to ensure we are invested in helping our young people be motivated and inspired to look into STEAM-related fields." Explains Nick Winter, Co-Founder/CEO of Code Combat: "Kids who become part of the Code & Play online community at LenovoGameState.com cover most of the programming concepts from the first two computer science courses for CS majors from many universities. They may be middle or high school students, but with game-based learning, they're motivated to obtain even higher levels of knowledge." LenovoGameState.com offers 142 levels of Code & Play Adventure that teaches kids to code while they play their way through three immersive worlds. Starting in Kithgard Dungeon, the player's chosen hero has been imprisoned by ogres and must sneak, puzzle and battle their way out by writing code to control their hero. Players start out learning programming basics like writing syntax, calling methods and storing data in variables before moving on to exploring if-statements, x-y coordinates, Boolean operators and other coding concepts. The quest continues through the lands of Backwoods Forest and Sarven Desert where multiplayer arenas give players a chance to develop their own artificial intelligence code for their heroes to compete against each other. Watch the Code & Play Adventure trailer at https://www.youtube.com/watch?v=JBSZe5IuDvI. Founded by Amy Poehler and Meredith Walker, Smart Girls is dedicated to providing a healthy alternative to so much that is being marketed to young people on the Internet. Our motto is: Change the World by Being Yourself. What began as a web series for young girls and an excuse to host spontaneous dance parties has become a place for information, comedy and community. We emphasize intelligence and imagination over "fitting in." We celebrate curiosity over gossip. We are a place where people can truly be their weird and wonderful selves. We are funny first, and informative second, hosting the party you want to attend. In 2015, Smart Girls originated the viral social media campaign #SmartGirlsAsk, an initiative dedicated to elevating the types of questions asked of celebrities on the red carpet and beyond. Smart Girls was acquired by Legendary Entertainment in October 2014. Visit amysmartgirls.com to join the community. Lenovo (HKSE: 0992) (PINK SHEETS: LNVGY) is a global Fortune 500 company and a leader in providing innovative consumer, commercial, and enterprise technology. Our portfolio of high-quality, secure products and services covers PCs (including the legendary Think and multimode YOGA brands), workstations, servers, storage, smart TVs and a family of mobile products like smartphones (including the Motorola brand), tablets and apps. Join us on LinkedIn, follow us on Facebook or Twitter ( @Lenovo) or visit us at www.lenovo.com.